St John the Divine Church is located at the corner of Drouillard and Richmond in the Ford City area of Windsor, Ontario Canada. Get off at Essex Road (46W) Exit 14 (toward Windsor). Follow Provincial Road CR-46 to Walker Road (turn right). Continue for approximately 5 miles to Richmond Street (turn right). Go approximately 1/2 mile and the church is on the Left. After passing thru customs, on the Canadian side, make a quick right onto Huron Church, continue North until you reach Riverside Drive. Make a right on Riverside, you will go approximately 4.5 miles, passing thru the city, past the Casino, past the Hiram Walker Complex. At Our Lady of the Rosary R. C. Church, turn right onto Drouillard Road. Continue .8 km (1/2 mile). Church is on left at corner of Drouillard and Richmond. Park at the Gino A. Marcus Community Complex (1/2 block beyond). The church is 4.3 km (2.67 miles) from the tunnel. After passing thru customs, turn right. At the first light, turn left on Goyeau. Continue till you reach the river (Riverside Drive). Turn right onto Riverside, pass the Casino, Hiram Walker complex. 3.5 km (2.2 miles) from the border, at Our Lady of the Rosary R. C. Church, turn right onto Drouillard Road. Continue .8 km (1/2 mile). Church is on left at corner of Drouillard and Richmond. Park at the Gino A. Marcus Community Complex (1/2 block beyond). Parking is located 1/2 block South of the church on Drouillard at the Gino A. Marcus Community Complex. St. John the Divine is the only Orthodox church in Windsor with traditional Orthodox services celebrated totally in English. Confessions are heard on Saturday Evening, before or after Vespers and on Sunday Morning, 9:30 to 10:00 AM. Call Fr. Dean should you have any questions about services. The Orthodox faithful in the City of Windsor did not have their own church. 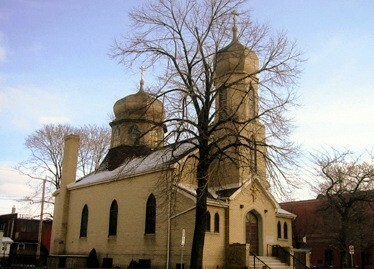 This sizable colony, comprised of Russians, Bessarabians, Bukovinians, Carpathians, Galicians, Serbians, Ukrainians, Romanians, and Greeks had to travel to Detroit, attend a French Catholic church, or on some occasions they would invite an Orthodox priest from another area, to fulfil their spiritual needs. In 1914, the faithful began to formally organize their own Orthodox Church in Windsor. Several Orthodox Christians gathered at the meeting. They were able to collect enough money to purchase two lots on the corner of Drouillard and Richmond Street. They began building the church in the name of St John the Divine (Evangelist) in the summer of 1916, and completed the entire project by December of the same year, which was then blessed by assigned priest, Fr Joseph Shekaley. The church was registered in 1917 under the jurisdiction of Bishop Evdokim. In 1924, in the wake of the war and the communist revolution, many refugees from Russia settled in Canada, and the Church grew in numbers and energy. Parish life was in full swing. They leased a building near the church to use as a Social Hall and organized dances, banquets and concerts which brought in substantial revenue. They also organized an impressive library of books of distinguished Russian writers. Eventually, the parishioners realized that it would be much more economical to build their own hall, so the rector, Father Fedorchuk, along with parishioners and contractors, began to create a basement beneath the church, and when the construction was completed, and the parishioners began to use their new Parish Hall in 1929. Father Fedorchuk and Fedor Buchovsky organized a choral group in the name of St Roman the Sweet. From this group, the rector chose singers for the Church Choir, and he also formed a sisterhood in the name of the Dormition of the Holy Virgin Mary who was responsible for the upkeep of the Church, and handled the preparations for banquets and special events. As in many other cities, many new Orthodox parishes began organizing, but reflecting more specific nationality and linguistic backgrounds. These times saw St John the Divine changing from being the one Church for all Orthodox, to one of several churches. However, we are still recognized as the “Mother Church of Orthodoxy” in the City of Windsor. In 1939, Metropolitan THEOPHILUS assigned Fr. Evgeny Serebrennikoff to the parish. He is best known as a good organizer and by obtaining a new charter for the church. He also began the “Russian Day” picnics which boosted morale and helped financially. The year 1942 brought many celebrations during the parish’s twenty-fifth year. On February 1st, Fr Anthony, Deacon Lukian, and many area clergy celebrated the Silver Jubilee. The Church was filled with parishioners, friends, and invited guests, including the Mayor of the City of Windsor (who helped cut the cake). After the banquet, a concert was staged with music, dancing and recitations. The second event of the Jubilee was held on October 11th, which is the feast day of St John the Divine. At this time enough money was pledged to completely repay all of the outstanding debts. It was indeed a day of celebration. In 1946, the church was severely damaged by fire. However, with no insurance, but with true Christian spirit, parishioners raised funds, organized working groups, and rebuilt the church with brick, and on November 27, 1949, the corner stone of the new St. John the Divine Church was blessed. It is interesting to note that in spite of many previous short terms of clergy at the church, V. Rev. Lukian Steciuk served faithfully from 1934 as Reader, 1936 as Deacon, and from 1944 as rector until his death in 1976. In 2005, a group of Fr. SteciukÃÂ­s family members led the challenge to renovate the church and parish hall. With the blessing of His Eminence, Archbishop Seraphim, Fr. Dean was ordained on January 1, 2007 to serve the community and help continue with its renewal.